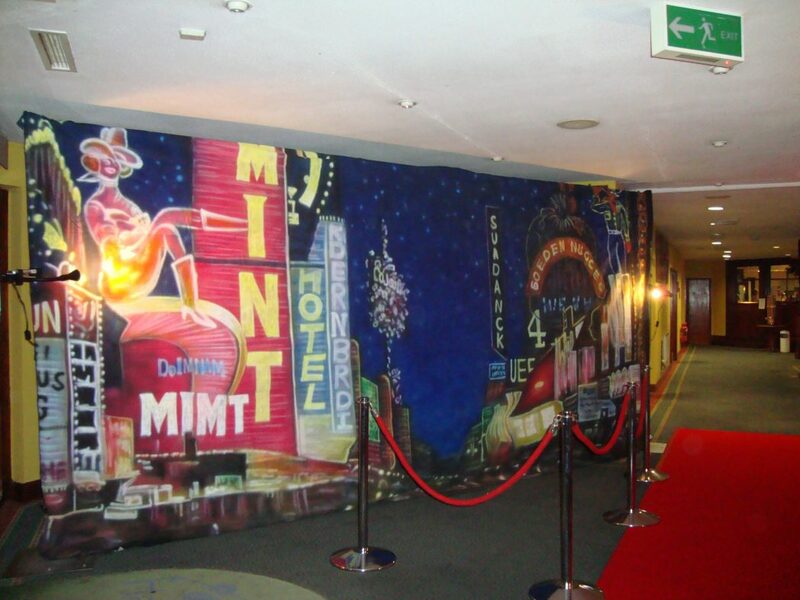 For the full Las Vegas theme party hire we have the most amazing props and backdrops. We will transform your venue into a top Vegas casino. As you walk down the red carpet you are greeted by beautiful showgirls handing out champagne, past the ‘welcome to Vegas’ sign, you see a Marilyn Monroe lookalike playing roulette at the fun casino tables. With the ”Vegas theme party hire” the entertainment is great, there is a Rat Pack tribute singing on stage, you hear the cheers as the slot machines have started paying out. We have all the fun casino tables for your Vegas theme party hire and will transform your venue with the Vegas theme props, the giant dice, the huge playing cards and the Casino signs. The Vegas theme party is definitely one of our most popular themes, we have all the Vegas style backdrops and really will turn your venue into something else. The Vegas theme night is a great Las Vegas theme party – fun casino tables includes. The Vegas party night takes you for a walk down the strip. The Vegas themed party is full of neon flashing lights and bright colours, it is a great casino themed party. The Las Vegas theme nights are the best, with the Las Vegas theme party you get the best entertainers to make the best Las Vegas theme night. No Vegas theme night would be complete without the Elvis tribute act. The Vegas theme parties encourage guests to gamble their fun money. Our Las Vegas theme parties are famously good. The Las Vegas themed night is our favourite. Hire vegas theme party and we will make your party one to be remembered. We hire vegas theme parties throughout the UK. You can hire vegas theme nights anytime you want. The Vegas theme party hire is completed when the fun casino tables open, here you can have your branded fun money, guests can play as much or as little as they want, learn all the games and practice for when they really do go to Las Vegas. The Vegas theme party is extremely popular for company parties and also as a second party for people who got married out there. The Vegas theme party hire is very opulent and lavish, it has all the adrenaline of the fun casino tables and all the style of the great performers who were around at the time.